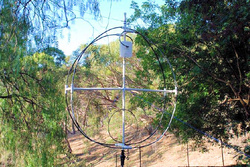 VK5SFA wins ARRL antenna competition – The Radio Amateur Society of Australia Inc.
Well known antenna guru, Steve VK5SFA has won the ARRL antenna competition. The criteria this year called for compact designs for those with space restrictions. The antenna had to cover any band from 2200 metres to 10 metres. “Dozens of entries were received, but only three could win,” said QSTEditor Steve Ford, WB8IMY. ← The world’s best AR station?